The Celebration of the Black begins with the unfurling of the Banner of the Black Moon. Delivered to the streets of Bergholt by the gods, the Banner is raised high and paraded through streets and alleys for all to see. Everyone dons mask and cape, lights fires and burns incense, imbibes and enjoys a bacchanalia, only to be followed by deeds of heinous nature, murder most foul in dark alleys, killings and slaughter abound such that the night ends in dread and terror. What brings the Black Moon? This follow up to By Shadow of Night further explores the twisted streets of the city of Bergholt! 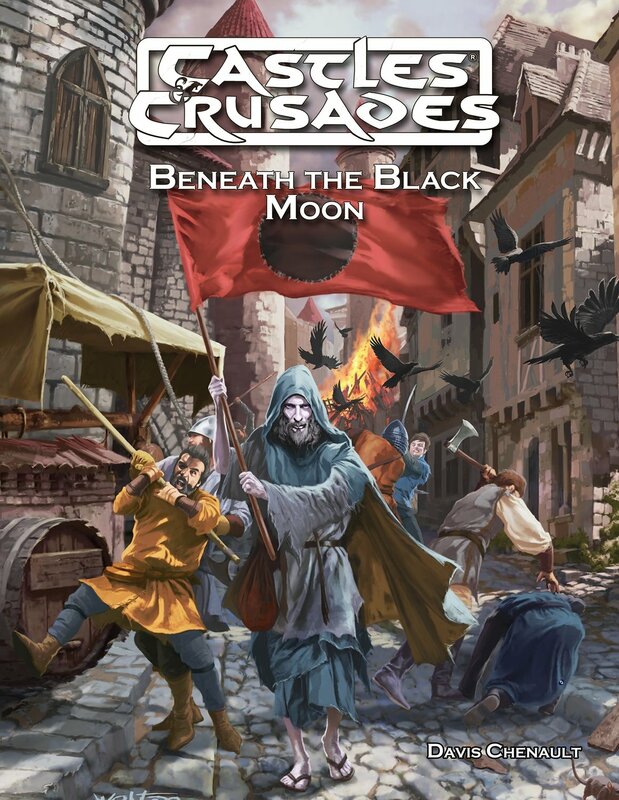 With over 30 encounter areas and hordes of NPCs of all types and descriptions, Beneath the Black Moon promises an untold number of adventures! Designed for use with 3-6 mid-level characters. Playable in the world of Inzae, or easily transplanted to any homebrew or other campaign.